Braze welding (also called bronze welding) is another procedure you can use to join two pieces of metal. It is very similar to fusion welding except you do not melt the base metal and you distribute the filler metal onto the metal surfaces by tinning. Braze welding can produce bonds comparable to those made by fusion welding without the destruction of the base metal characteristics. The equipment you need for braze welding is essentially identical to the equipment you need for brazing. However, braze welding usually requires more heat than brazing, so you should definitely use an oxyacetylene or oxy-MAPP torch for braze welding. Copper and zinc are the primary elements of a braze-welding rod; they provide ductility and high strength. Iron, tin, aluminum, manganese, chromium, lead, nickel, and silicon are also added in small amounts to improve the rod’s welding characteristics. These elements aid in deoxidizing the weld metal, increasing flow action, and decreasing the chances of fuming. Proper fluxing is as essential in braze welding as it is in the other processes; if the surface of the metal is not clean, the filler metal will not flow smoothly and evenly over the weld area. Even after you have mechanically cleaned the workpiece, certain oxides often remain and interfere with the flow of the filler metal, so always use the correct flux to eliminate them. Edge preparation is essential in braze welding. You can bevel the edges of thick parts by grinding, machining, or filing, but it is not necessary to bevel thin parts (1/4-inch or less). You need to make the piece bright and clean on the underside as well as on the top of the joint. If you clean with a file, steel wool, or abrasive paper, it will remove most of the foreign matter such as oils, greases, and oxides, and using the proper flux will complete the process to permit the tinning to bond. • Align parts and hold in position with clamps, tack welds, or both. • Preheat assembly to reduce expansion and contraction during welding. o Preheat method depends on the size of the casting or assembly. • Adjust flame to slightly oxidizing flame. o Note: More flux during the tinning process produces stronger welds. • Apply heat to base metal until it begins to turn red. • Melt some brazing rod onto surface and allow spreading along entire joint. o Note: You may have to add more filler metal to complete the tinning. o Note: Temperature control is critical. Base metal too hot — filler metal bubbles or runs around like beads of water on a hot pan. Base metal too cold — filler metal forms little balls that run off the metal. • Complete tinning entire joint. 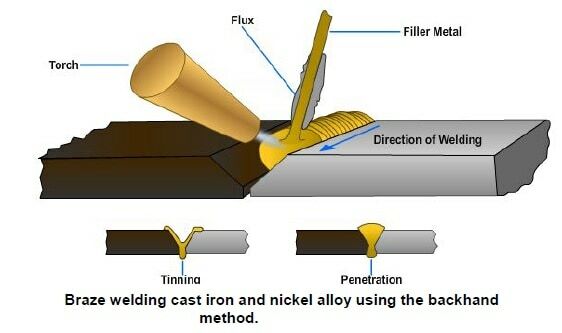 See Figure for an example of tinning and welding with the backhand method. • Begin adding beads of filler metal to fill joint. o Use a slight circular motion with the torch and run the beads as in regular fusion welding. o If the weld requires several passes, ensure each layer fuses with the previous one. • Upon completion of fill, heat area around joint on both sides for several inches to ensure even rate of cooling. • When joint is cold, remove any excess flux or other particles with stiff wire brush or steel wool.